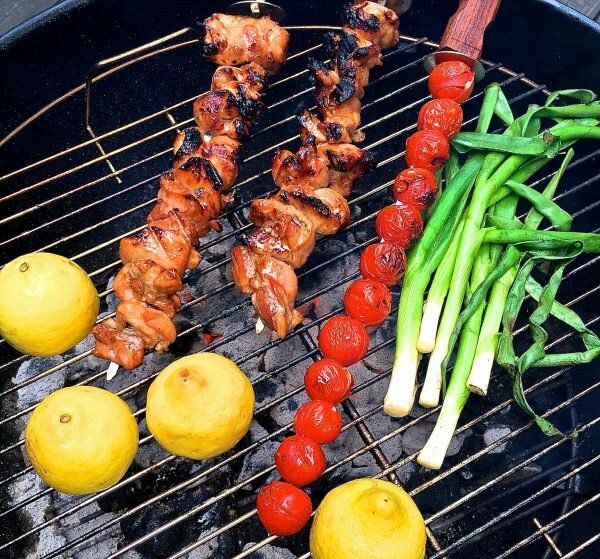 Just in time for your weekend cookout, I have a yummy, quick and easy and just a little different dish for you, Grilled Chicken Skewers with Tomato Relish. And, boy oh boy is it good! 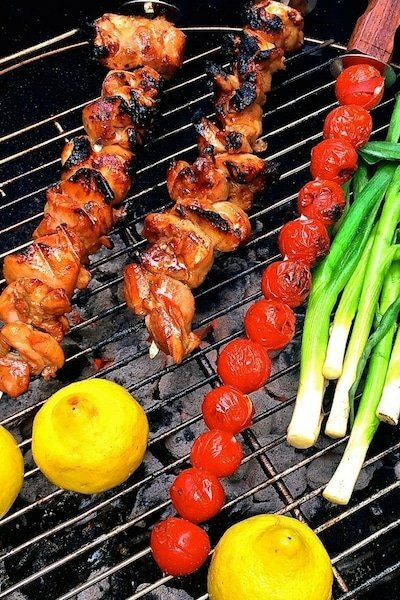 This foolproof recipe for Grilled Chicken Skewers with Tomato Relish uses flavorful boneless, skinless chicken thighs which have been marinated in a delicious sauce of pineapple juice, soy sauce, and brown sugar and then grilled. And, as if it wasn’t already tasty enough, the chicken is then topped with a bright, bold and scrumptious tomato relish made with grilled cherry tomatoes, scallions, and lemons. 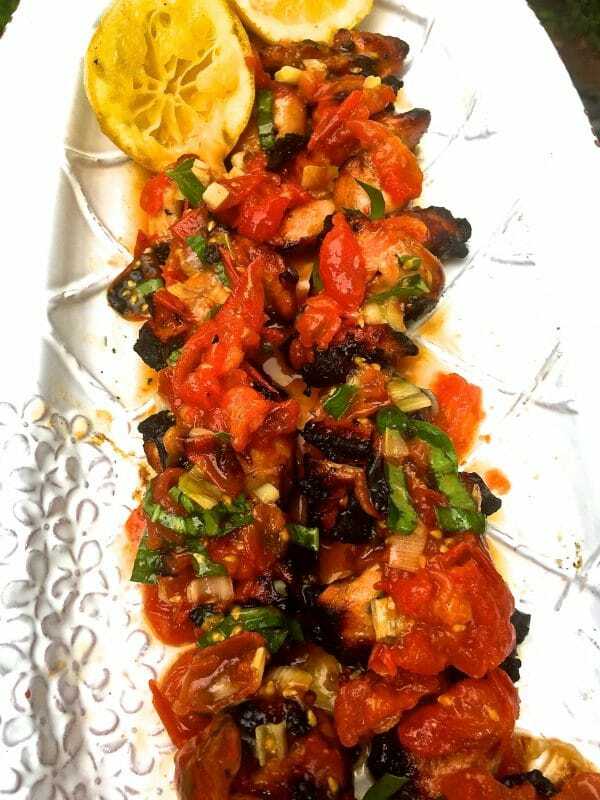 This delicious Tomato Relish is what sets this dish apart and it and it elevates the flavors of the marinated chicken to the next level. Add some quinoa, cauliflower rice or a pasta salad and you will have a healthy meal which is perfect for a family cookout or a barbecue with friends. If you love chicken cooked on the grill like I do, you might also like these recipes: The Best and Easiest Grilled Chicken, and Grilled Beer Can Chicken. To make this delicious dish gather your ingredients and add the pineapple juice, brown sugar, ketchup, soy sauce, ground ginger, and garlic to a small bowl and mix well. 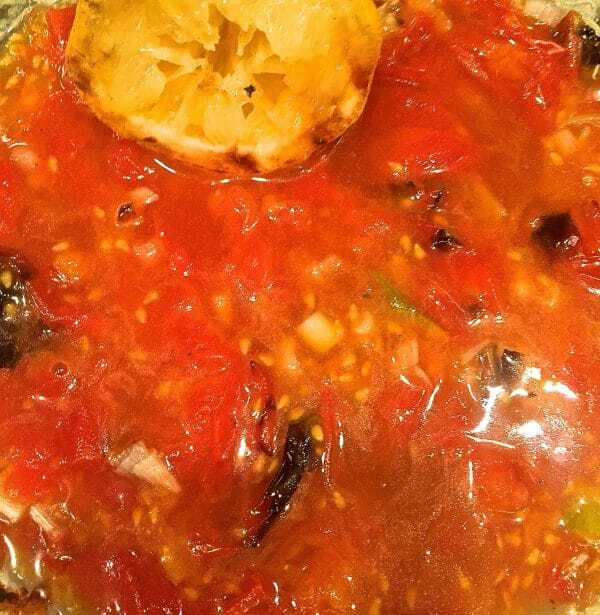 Reserve 2 tablespoons of the marinade mixture to add to the tomato relish. 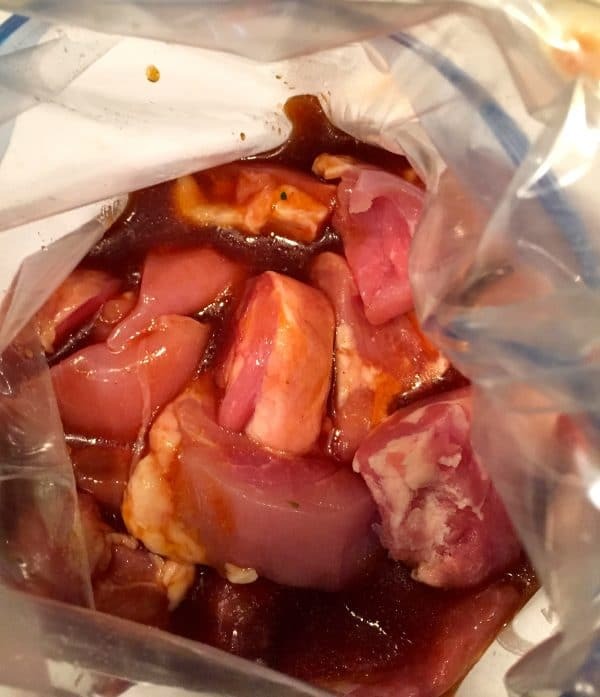 Loosely thread the chunks of marinated chicken on the skewers. The pieces should be touching, but not packed together or compressed. 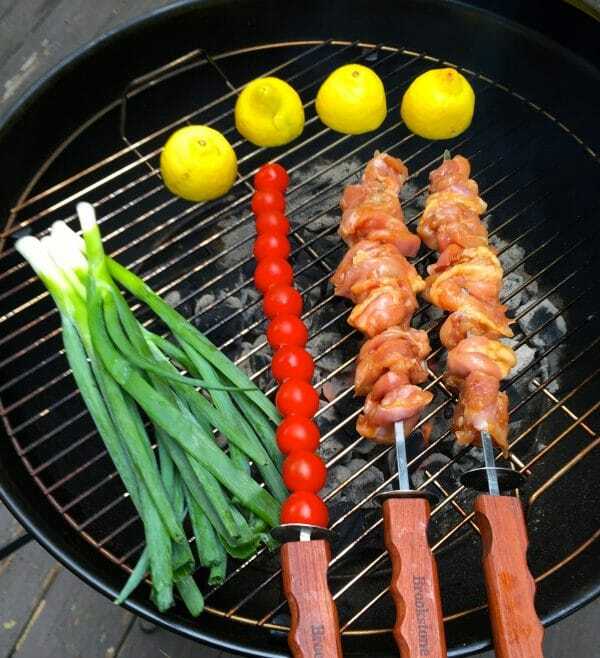 Thread the cherry tomatoes on the skewers. Set up your grill for direct heat cooking. Clean and oil the grate and place on the grill. 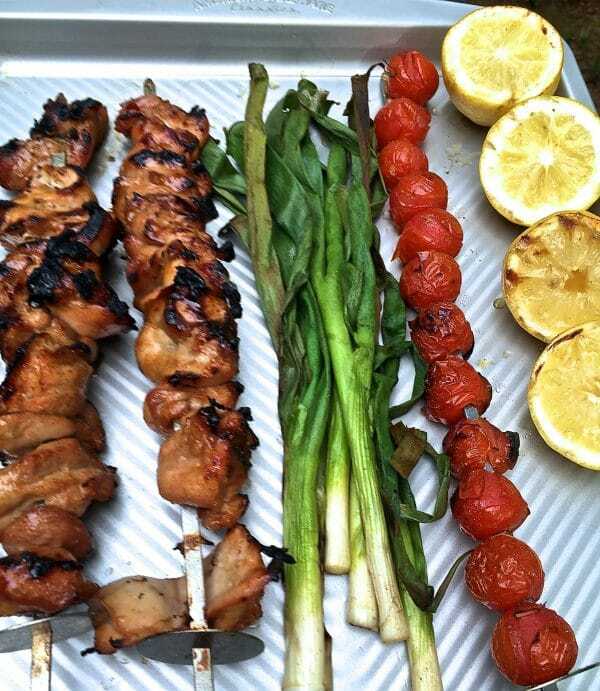 When the grill and grates are hot, place the chicken skewers, cherry tomato skewers, scallions and lemon halves cut side down on the grate and cover. Grill the chicken for about 15 minutes or until done, turning every few minutes or so. 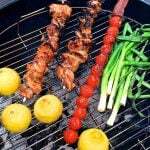 Grill the vegetables for about 10 minutes or until charred, turning scallions and tomatoes as needed to brown evenly. Remove the chicken and vegetables from the grill, tent the chicken with foil and let it rest for about 10 minutes. In the meantime, mix the reserved marinade, butter, and honey in a small saucepan over medium heat until the butter is melted. 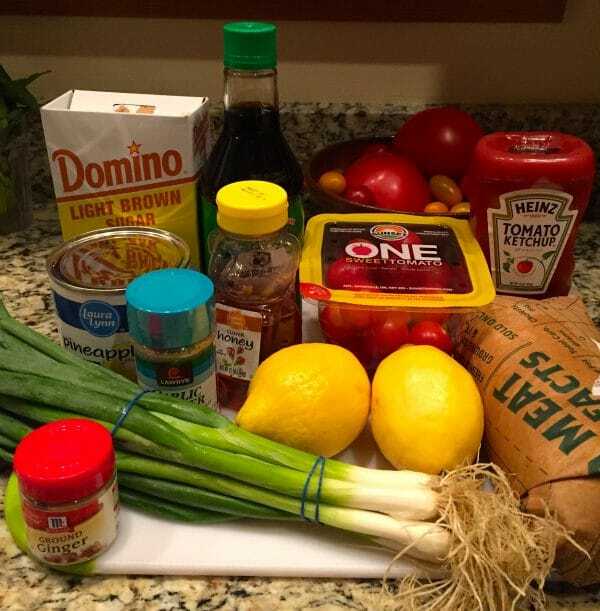 Chop the scallions, squeeze the juice out of the lemons, and combine with the tomatoes and honey mixture in a small bowl. Using a potato masher, coarsely mash the tomatoes. Add salt and pepper to taste if needed. Serve the tomato relish over the grilled chicken and garnish with fresh basil if desired. Enjoy! 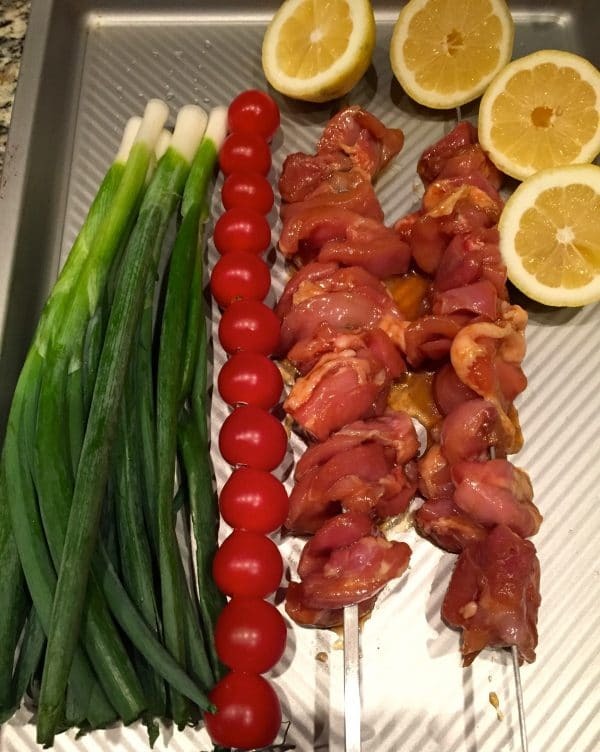 Perfect for your next BBQ, Grilled Chicken Skewers with Tomato Relish features marinated chicken kabobs topped with grilled tomatoes, scallions, and lemons! Add the pineapple juice, brown sugar, ketchup, soy sauce, ground ginger, and garlic to a small bowl and mix well. 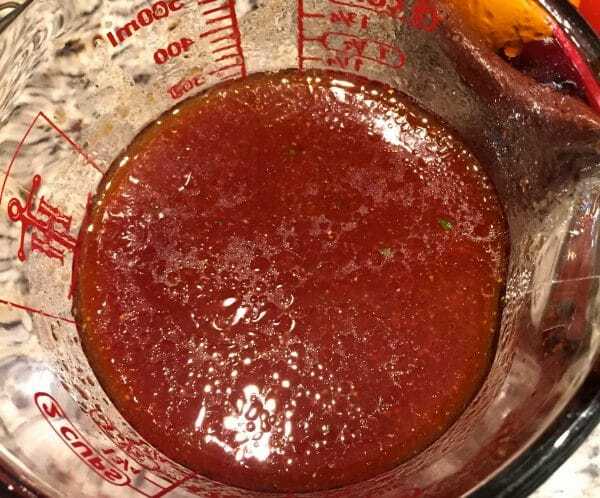 Reserve 2 Tablespoons of the marinade mixture to add to the tomato relish. Serve the tomato relish over the grilled chicken and garnish with chopped basil if desired. Enjoy!